The other day I got a package from my Skylanders contacts. The package was way too long and thin to be a Skylanders figure or even a super early copy of Swap Force (Coming out in October). No, this was a low tech Skylanders game, this was Skylanders™ Monopoly®. 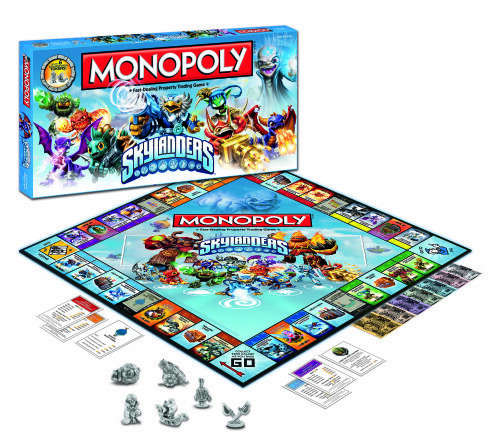 This board game combines the classic risk-taking and deal-making of Monopoly gameplay with the fun and excitement of the Skylanders™ world as players vie for control of the most coveted real estate in Skylands. Produced by USAopoly, under license from Hasbro, and in conjunction with Activision, this cherished board game with a Skylanders twist allows fans to buy, sell and trade 22 newly discovered Skylands locations and rule supreme. I have not gotten to play the game yet. We’re contemplating introducing Eva to Monopoly, a source of contention between my wife and I, she still has battle scars from playing as a kid. I always found it a fun game to play. Allison was the first to notice that the colors on the game board, Brown, Light Blue, Dark Blue, Green, Red, Orange, Purple and Yellow corresponded to the color schemes of the Skylanders figures elemental colors almost perfectly. We’ll eventually get to play this as a family but I wanted to show it to you and this little video I made. Custom Skylanders-Licensed Design: The Monopoly®: Skylanders™ box top and game board showcase custom art featuring the most popular Skylanders™ characters, so fans can jump right into the world of Skylands. 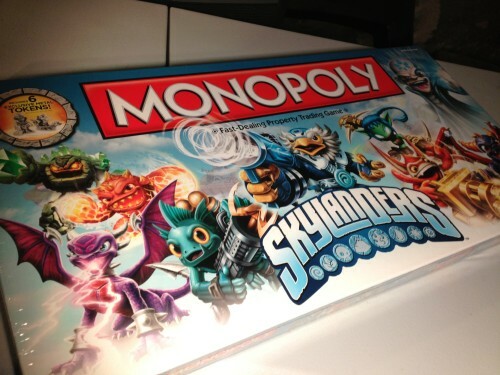 Familiar Monopoly Gameplay: Players will buy, sell and trade popular locations based on characters in the world of Skylanders™. Re-imagined Locations and Game Pieces: The game board includes 22 “newly discovered” Skylands locations such as Stealth Elf’s Ninja Dojo, Chop Chop’s Boneyard, and Trigger Happy’s Bank Vault, while other classic features such as metal game tokens, the Community Chest and Chance cards have all been reimagined for the fast-paced, high stakes world of Monopoly. Unique Collectible Metal Game Tokens: The familiar game tokens that players use to navigate through the game board have been completely redesigned for Skylanders™ fans. Players may choose to use one of six collectible metal tokens — KAOS, Sheep, Cannon, Pirate Ship, Swords or Chompie — as they traverse the world of Monopoly®: Skylanders™. Availability: Available now at Amazon.com and specialty stores throughout North America including Hastings, Entertainment Earth and GameStop Canada. Previous PostLoot Crate: Varsity – July Un-CratingNext PostSnikt! I’m ‪Wolverine‬. If You’re Smart You’ll Take the ‪Pez‬. Fun!!! I want to play!! !